Synopsis: The author of the bestselling Deborah Rising continues the fascinating story of the Biblical prophetess Deborah in this entrancing work of visionary fiction—a tale of danger, mysticism, intrigue, and daring for fans of The Red Tent, The Mists of Avalon, and The Alchemist. A riveting adventure tale derived from traditional biblical fiction, Deborah Calling imagines the life of one of the most famous figures from the Old Testament as she continues on her path to becoming a prophet. My Review: Deborah Calling picks up where Deborah Rising left off. The novel reimagines the early life of the prophetess Deborah from the Bible. Deborah is disguised as a man who works in a tannery. As she works, she learns how to grow physically stronger by gaining more muscle. One day, she and her master, Kassite, escape the tannery to rescue Kassite’s friend, Sallan. It is a risky and dangerous task because they may run into her abusive husband, Seesya. As Deborah undertakes this perilous road, she learns that God may have called her for a great purpose. While I did not see much resemblance to the Biblical Deborah, I am starting to see it here. Deborah is slowly learning how to become a leader and a warrior. I adored her because she is tough as nails. She reminds me a bit of Katniss Everdeen. I also like how Deborah is starting to learn to love herself and that she does not want to take the form of someone else. Deborah is becoming more self-confident and gathering more courage. Thus, I liked how her character has evolved from Deborah Rising, and I can’t wait to see how she is portrayed in the third book. Overall, this book is about courage, faith, forgiveness, and self-identity. The message of the novel is to be proud of yourself. The world of ancient Israel seems very realistic, and I can see how the world was a harsh place for both men and women. 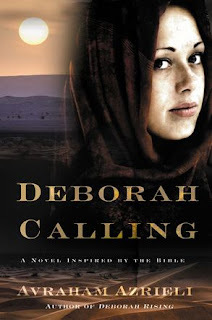 Deborah Calling was very well-written and thought-provoking. While I loved Deborah Rising, I have to confess that Deborah Calling surpasses its predecessor. It has got me excited for book three, and I wish that it was already out now. In the meantime, I will definitely re-read the series again to satisfy my craving for the wait! Readers will love the Deborah series, not only because it is a fast-paced and adventurous historical tale, but it features a strong relatable heroine that embarks on a journey of faith.